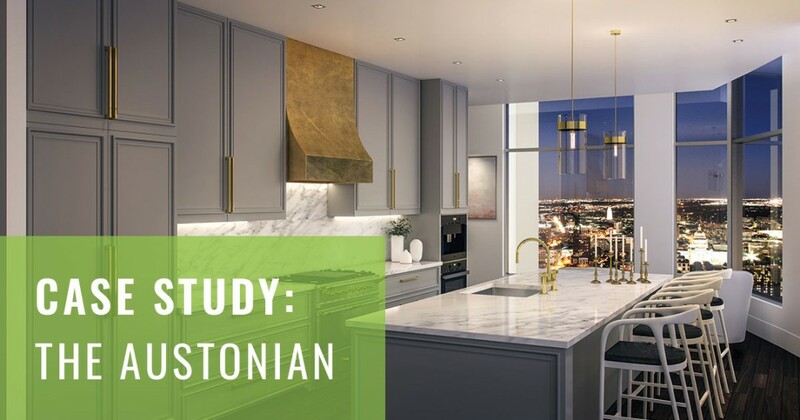 Project Description: Design interior living spaces and produce high quality, photorealistic renderings that portray the unparalleled luxury of The Austonian’s penthouses and condos. The tallest residential building in Texas, The Austonian has proudly towered above downtown Austin since it’s completion in 2010. The high-rise is located at Congress Avenue and 2nd Street, offering residents premiere service and amenities in the heart of the city. Minutes from the Texas State Capital, The Austonian is also walking distance from hundreds of top restaurants, nightclubs, boutiques, parks and cultural attractions. Residents enjoy 40,000 square feet of amenity space that includes a saltwater pool and spa, outdoor kitchens, state-of-the-art fitness center, a theater, dog grooming salon and dog park, and wine cellar. A 24-hour personal concierge is also offered, as well as event planning and valet services. With luxury comes a price, however. How does a real estate broker create a vision for a prospective tenant? What is needed to close the deal? In 2016, Moreland Properties approached us with that very question. In the world of luxury real estate, brokers must convey a sense of exclusivity. Convincing prospective owners proves more challenging when a space is unfurnished, or a blank slate. Floor plans and bare rooms are often not enough to transport the viewer and establish a feeling of unrivaled abundance. A high-end, eclectic mix of home furnishings are often essential in crafting a purposeful message. Moreland Properties leaned on TILTPIXEL to design interior spaces that reflect The Austonian’s premiere level of luxurious living. Through a series of high-end renderings, TILTPIXEL armed Moreland with marketing materials that bolstered the property’s brand story and enriched their sales strategy. TILTPIXEL designed interior penthouse spaces and delivered 13 renderings (12 interior and 1 exterior) in 2016 and 2018. Sales of units at The Austonian spiked after Moreland Properties released a new website and marketing materials with TILTPIXEL’s renderings. In addition, a significant cost-savings was achieved. The need for an interior designer was reduced, as was the dependence on high-end furnishings and staging. All images were created in 3D without relying on physical décor to define the interior aesthetic.